We woke to yet another hot, sunny day. After breakfast in our apartment we took the metro to Rådhuset and then walked a short distance along the waterfront to the Stromma Line booking office outside City Hall. 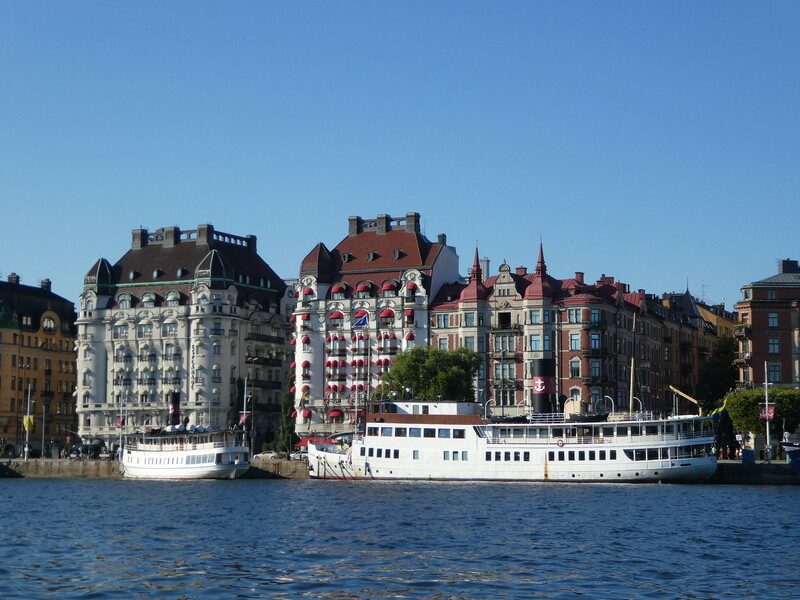 We had decided to obtain the Stockholm Pass which allows entry to numerous top attractions and boat trips in the capital. We opted for the 48 hour pass which costs SEK 845 (£72.60 each). I would recommend checking the entry admissions to specific attractions you may wish to visit to see if it is beneficial to you. Activating our passes at the Stromma boat kiosk, we booked the 10.00 a.m. sailing to Drottningholm Palace and boat tour of Lake Mälaren. The cost of this tour would have been SEK 350 (£29.75 each) without the Stockholm Pass. 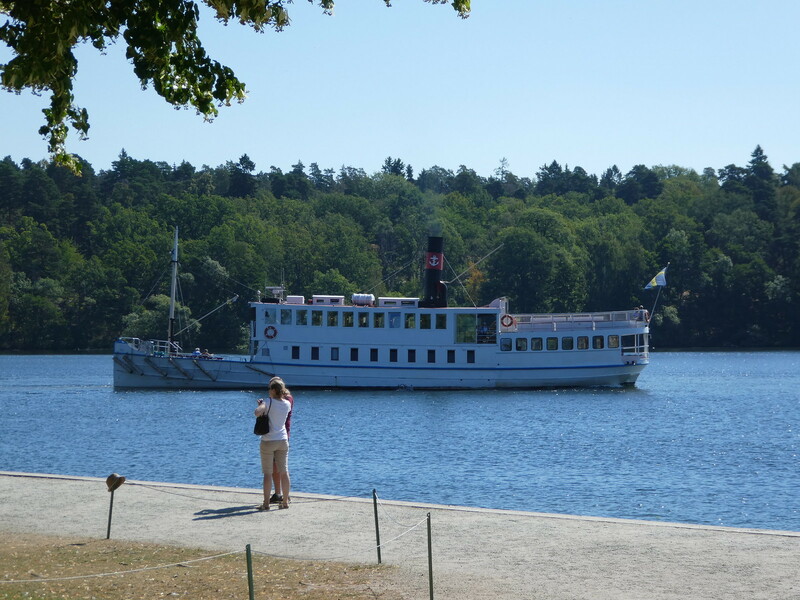 It was a scenic, hour long cruise on the M/S Prins Carl Philip (1901) steamer to Drottningholm Palace. The boat has an upper sun deck, cafe, restaurant and indoor seating and although quite busy, there were plenty of seats for everyone to enjoy a relaxing boat trip. 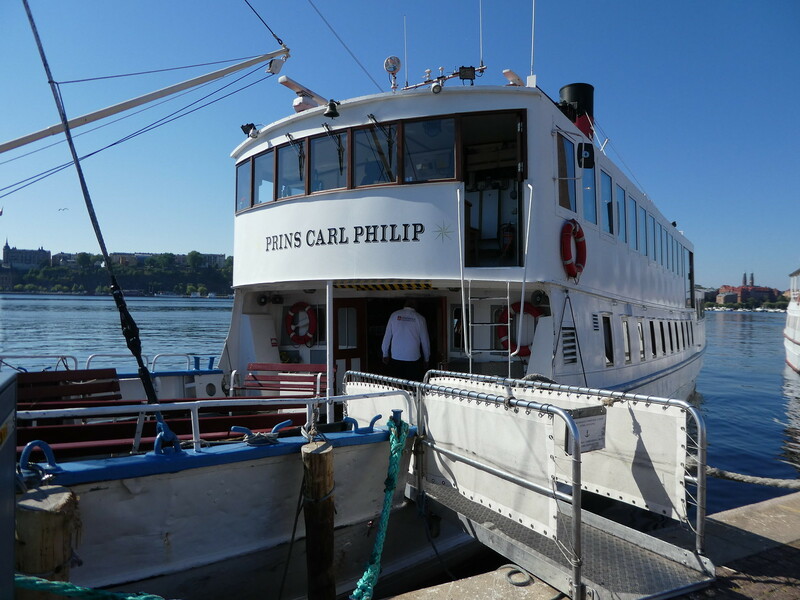 The boat moored in front of the majestic, world heritage royal palace and we followed signs to the ticket hall on the first floor where there is a fast track counter for those in possession of the Stockholm Pass, thus avoiding queues. 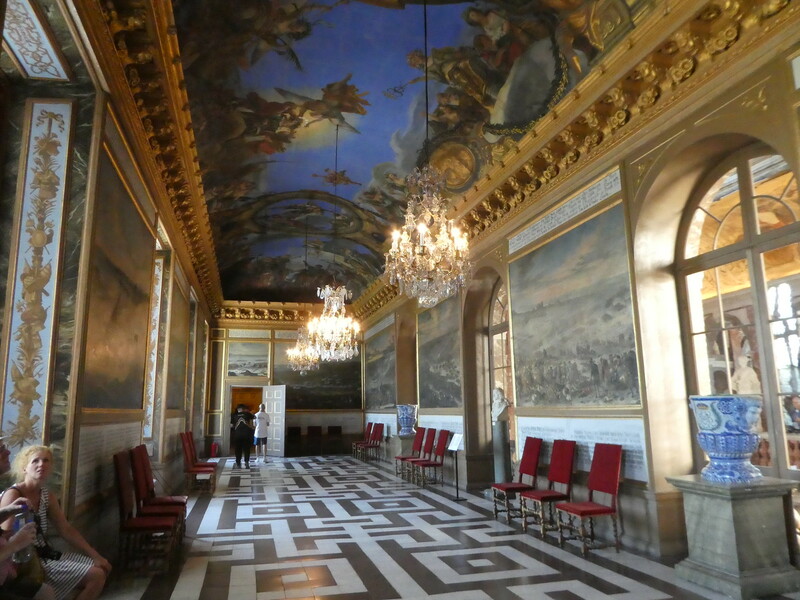 There was a SEK 30 supplement for guided tours so we just decided to pick up maps and audio guides and wander around at our own pace exploring the grandeur of this magnificent palace. Drottningholm is a UNESCO World Heritage Site in recognition of it being the best preserved royal residence built in Sweden in the 1600’s. The rooms in the south wing are reserved for the King and Queen’s residence with the remainder of the palace and grounds being open to the public so there was plenty to see. After exploring the palace we strolled through the formal gardens trying to stay in the shade as much as possible as it was extremely hot. In the far corner of the rear garden lies the Chinese Pavilion, a beautiful circular pleasure palace. 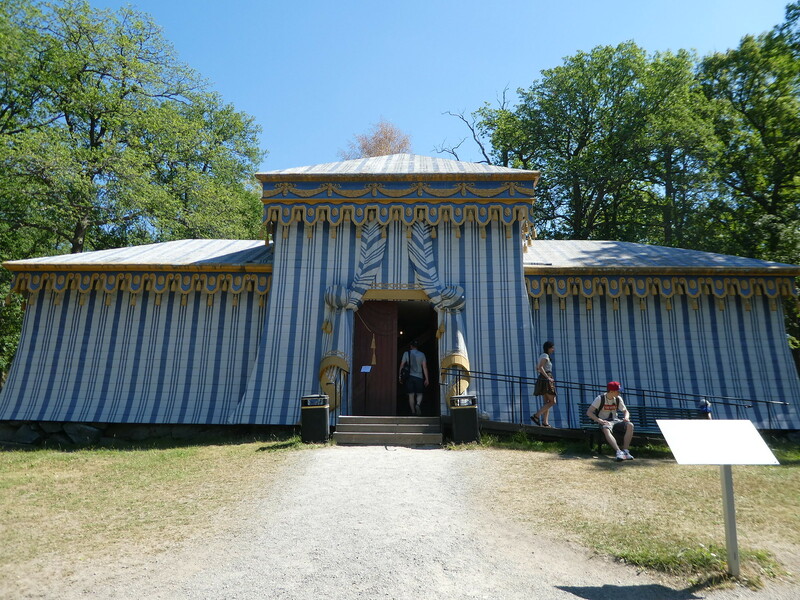 Admission to the pavilion was also included in the Stockholm Pass otherwise we would have needed to pay an additional SEK 100 (£8.60) to look around. 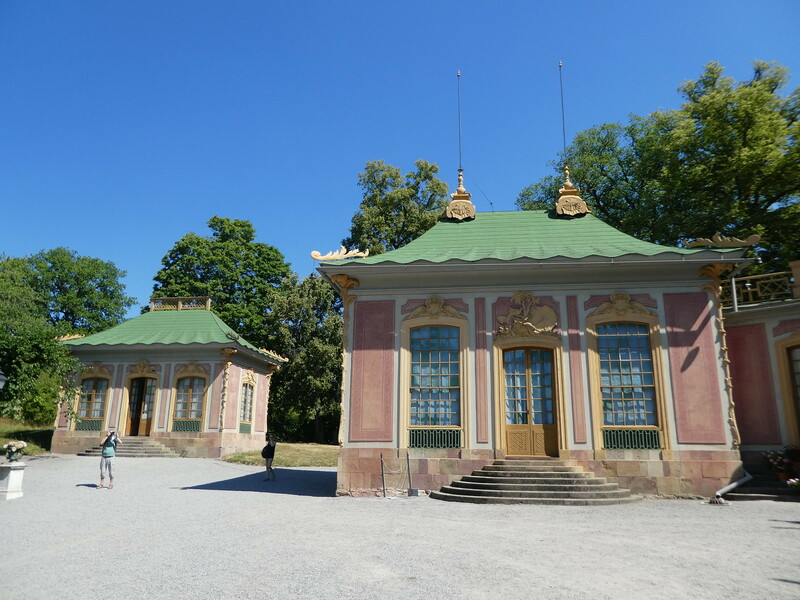 It was certainly unusual to find a Chinese Pavilion in Sweden. This was filled with artefacts collected on overseas trips and given to the royal family as gifts. Several of the exquisite silk screens were being renovated in one of the rooms and we were able to view this procedure taking place. Wandering along a different footpath back towards the palace we paused briefly to look inside the Guard’s Tent which creates the impression of being made out of canvas but is, in fact, metal. This is where the palace guards came for their breaks when off duty. We then slowly made our way back to the jetty with just a few minutes to spare before the 1.00 p.m. boat departed. 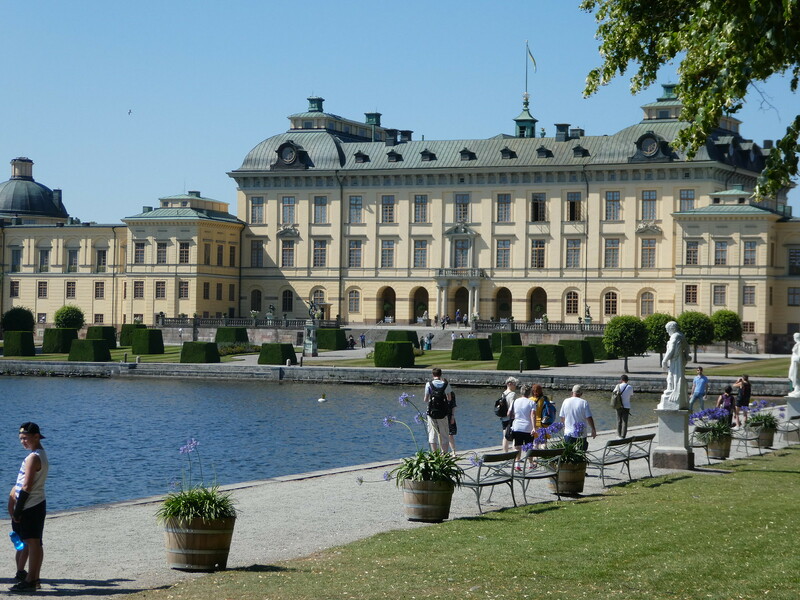 I think that a two hour visit would comfortably cover everything at Drottningholm but if you decide to have lunch or afternoon tea then you would probably need a little longer. In high season boats run every 30 minutes and passengers can return on any service. Our return boat was much quieter than the outbound one and we sat indoors as it was too hot out on the sun deck without a canopy. 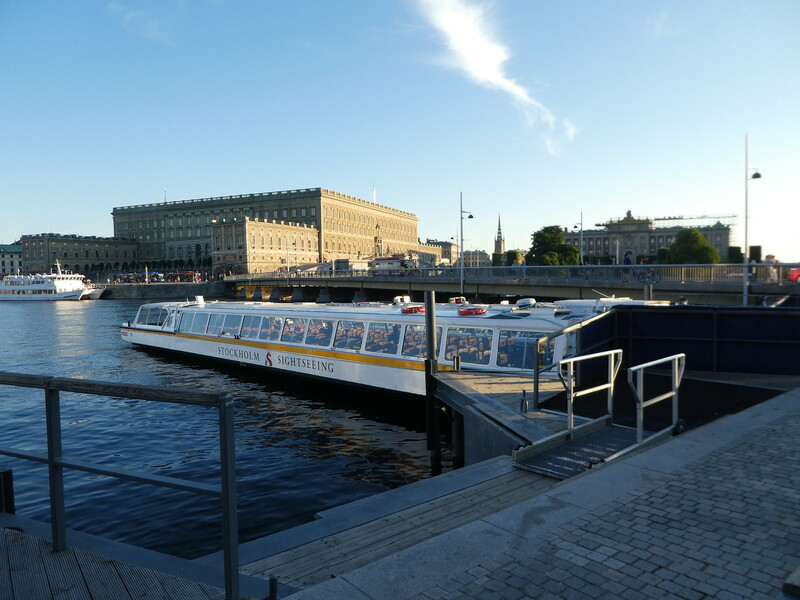 The boat returned to our starting point at City Hall at 2.00 p.m. and from there we wandered over to the metro station at T-Centralen and caught a train to Globen a few stops out of the city centre. 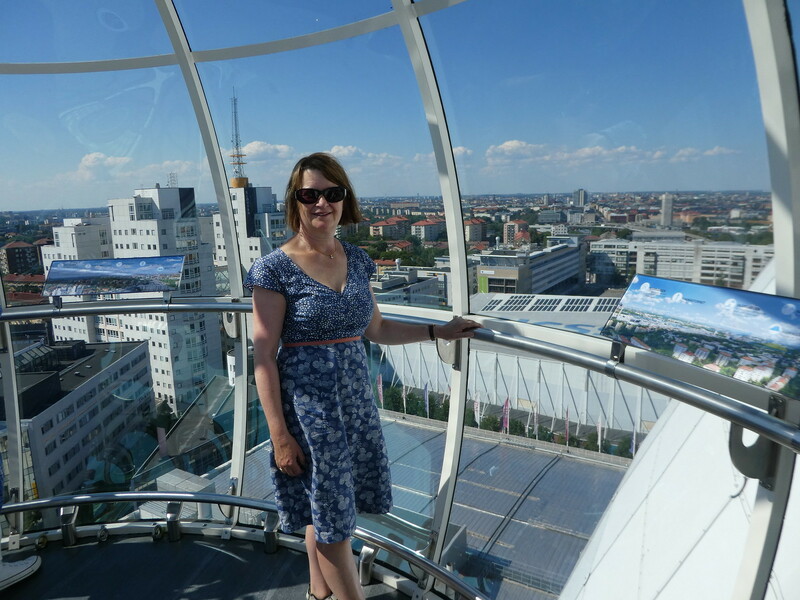 We had come to this district to take a ride on SkyView, a glass gondola taking visitors to the top of the world’s largest spherical building, the Ericsson Globe. Tickets to the top of this Stockholm landmark cost SEK 150 each (£12.75) and as the attraction is included in the Stockholm Pass we were able to use our cards. We assumed it would be similar to the London Eye or Singapore Flyer and that there would be a long queue. We were wrong on both counts as we must have picked a good time to visit with few people waiting, but were surprised to find that it’s not actually a Ferris wheel. Collecting our tickets, we were advised that the next ‘ride’ would depart in 7 minutes so we looked in the gift shop until we could go through. 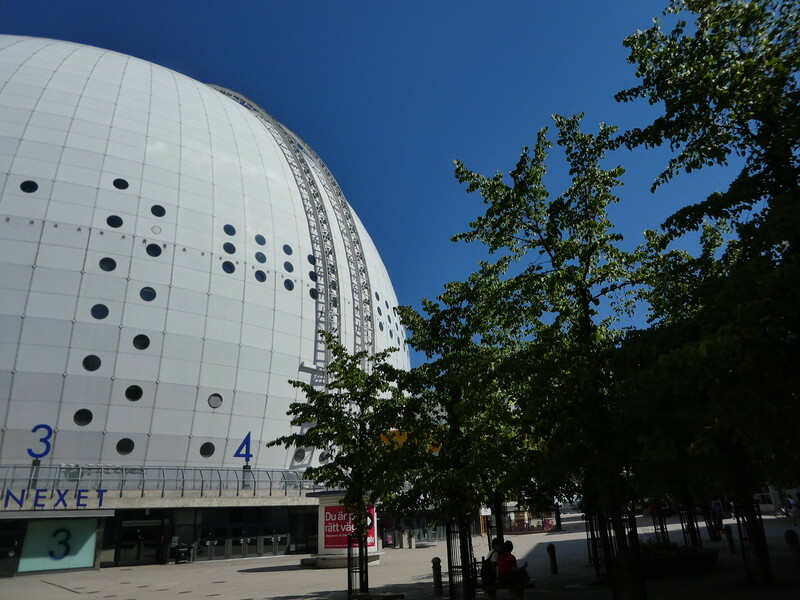 A group of 8 of us were ushered into a small cinema where we watched a short video describing the Ericsson Globe, the Globen area, its concert venues, ice hockey stadium and about SkyView itself. It was then time to board our gondola with the other people. 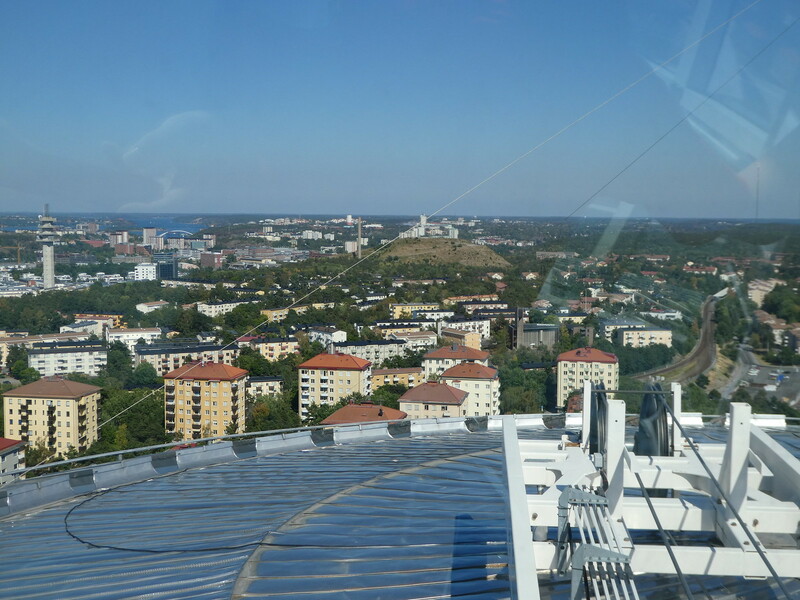 The glass ball had seating in the middle and slowly followed a track up the side of the huge white Ericsson Globe pausing for a few minutes at the top then returning back down the same track to its starting point. From the summit, which is 130 metres (425 ft) above sea level we benefited from some spectacular views across the city as it was such a clear day. Although I enjoyed the experience, I found it to be slightly underwhelming. I didn’t really think it compared to swinging in a gondola from a Ferris wheel but its certainly something different and a feat of modern day engineering. The two SkyView gondolas depart every ten minutes with the entire trip taking 30 minutes. Back at ground level we were feeling thirsty so we found a cafe near SkyView for some strawberry milk shakes before heading to Gamla Stan (the old town) by metro. Dominating Stortorget (the main square) is the Nobel Museum so we took advantage of our passes once again and saved SEK 120 (£10.20 each) on admission. 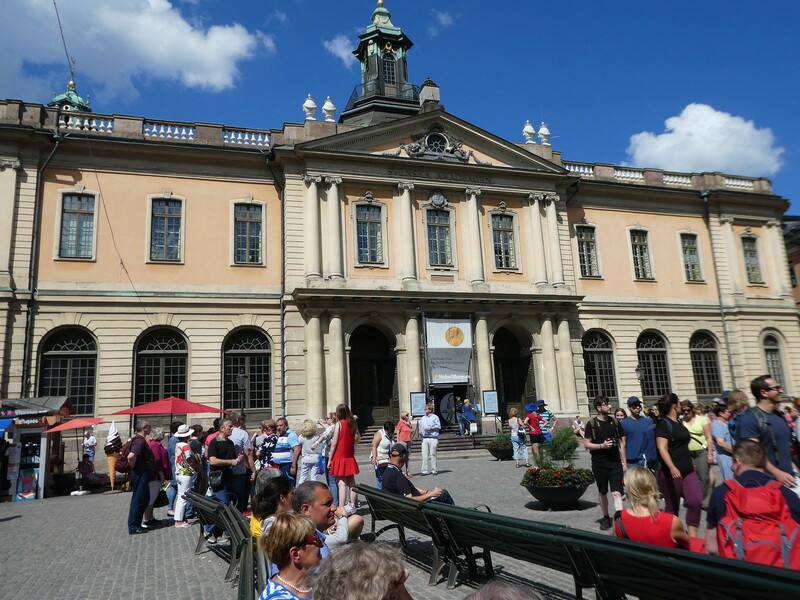 The Nobel Museum opened in 2001 in conjunction with the 100th anniversary of the Nobel Prize. 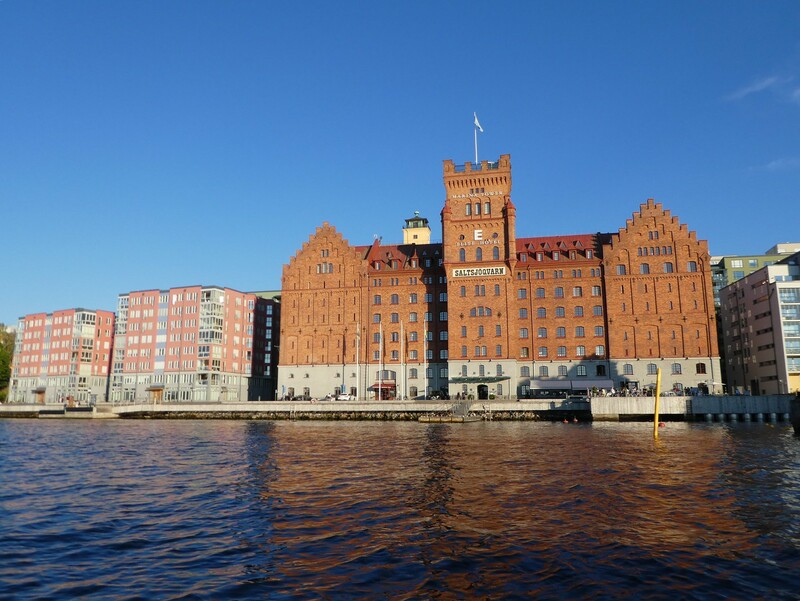 It is currently based in Borshuset (the old Stock Exchange) whilst purpose built new premises are completed. Alfred Nobel (1833-1896) was the Swedish inventor of dynamite, an engineer, entrepreneur, business man, author and pacifist. In his will he left SEK 31 million to fund the prizes for the establishment of the Nobel Prize. The prizes in Physics, Chemistry, Physiology / Medicine and Literature are awarded on 10th December each year in Stockholm City Hall on the anniversary of his death whilst the Nobel Peace Prize is awarded in Oslo, Norway. 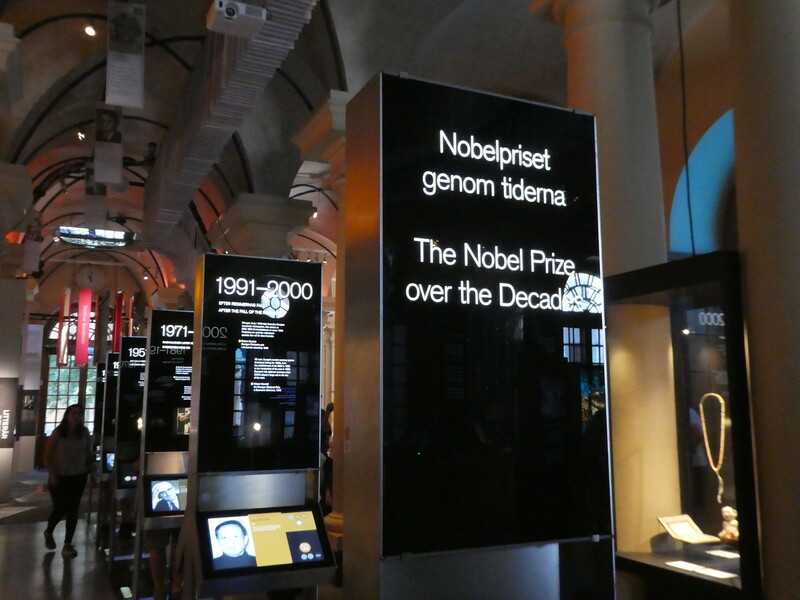 I’m so pleased we found time to visit this museum as it was so interesting learning why the Nobel award was set up and of the many scientific ideas that have changed the world. Single items of memorabilia donated by the laureates themselves were on display which were timely reminders of their research. Posters of past winners are suspended from the ceiling and slowly rotate along a track highlighting each one in turn. Leaving the museum we just had time to fit in one more activity on the first day of our pass, so we booked onto the 6.00 p.m. ‘Under the Bridges’ two and a half hour boat trip which departed from outside the Grand Hotel, not very far far the old town. This tour would have set us back SEK 280 (£24.05) had we not had the Stockholm Pass. The boat trip was on one of those long, low boats that can fit under bridges. Seating was around tables and each passenger was equipped with an audio guide headset which could be set to numerous different languages. The boat trip was very relaxing, passing through a lock and out into Lake Mälaren. 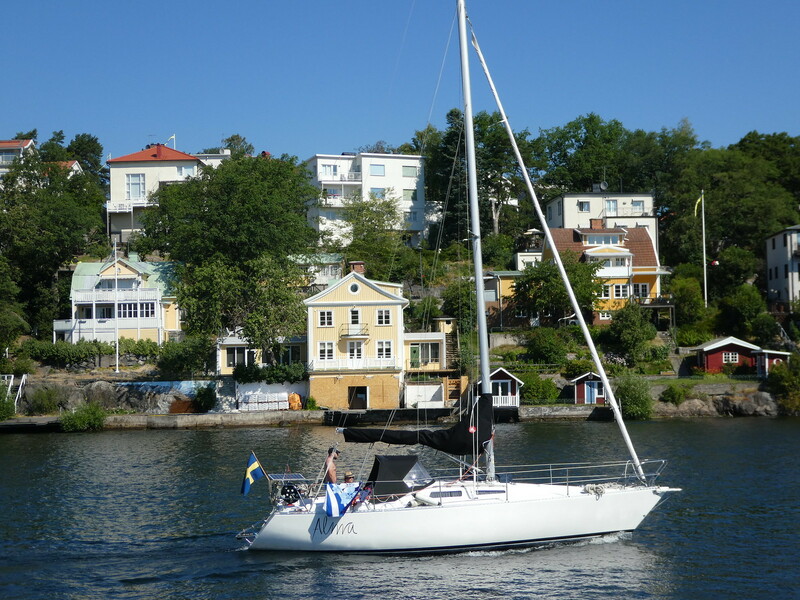 We sailed through numerous Stockholm waterside neighbourhoods where locals were enjoying the evening sunshine sitting outdoors in bars and cafes. Lots of people were also having picnics on secluded beaches, swimming and taking to the water themselves. I’d recommend this boat trip as it introduced us to parts of the city that we would probably not have seen and was a relaxing way to spend the evening after a busy day of sightseeing. Wowwww it’s nice to read ur blog. Thank you, I’m glad you are enjoying reading my posts. It was a bit of a jam packed day but we saw no point in not making full use of our passes Jason. Thank you for your ever welcome thoughts! Hi, Your day was certainly event full. I am amazed how much you were able to pack into the day. Thanks you Margaret, it’s good to hear from you. The day was jam packed, busier than we would normally like but we did want to make the most out of our Stockholm Pass! Thank you, Stockholm is a beautiful city to visit with so many nice things to see and do! Its on my travel bucket list! 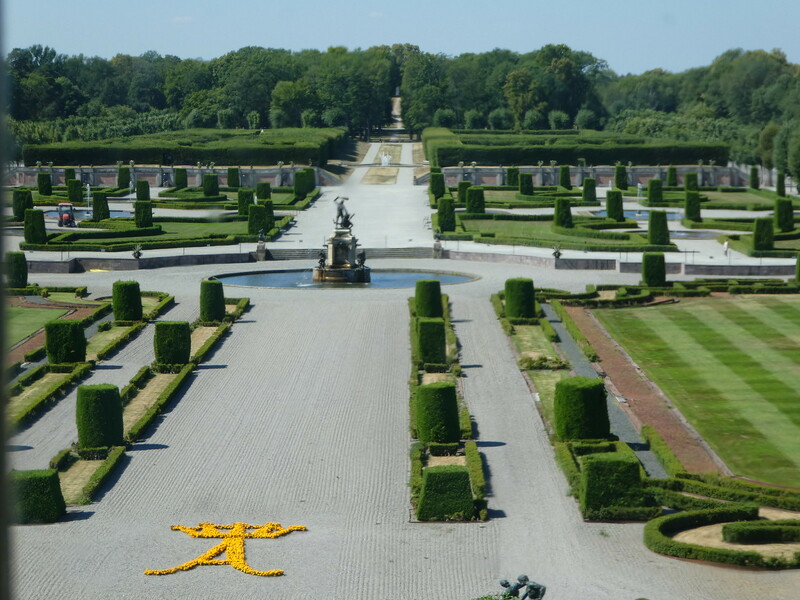 Thank you Ingrid, the palace garden was really beautiful. There were so much to see in Your blog. Most of all I loved the steamer and the Cruise, which You made. We always make lake cruises when possible. One exotic cruise was the Cruise on Lake Inari, which 308 km north of the Arctic Circle. Thank You again for this high-quality post. Thank you for taking the time to read my posts on Stockholm Matti and for your ever welcome thoughts. I would absolutely love to take a cruise on a Lake Inari one day! Beautiful travelog – thanks for sharing ! It’s my pleasure, I’m glad you enjoyed it. Glad you had the chance to get out to the palace. The theater is stunning and was mothballed for 200 years making it the only truly originally functioning Baroque theater – even the original mechanisms work. 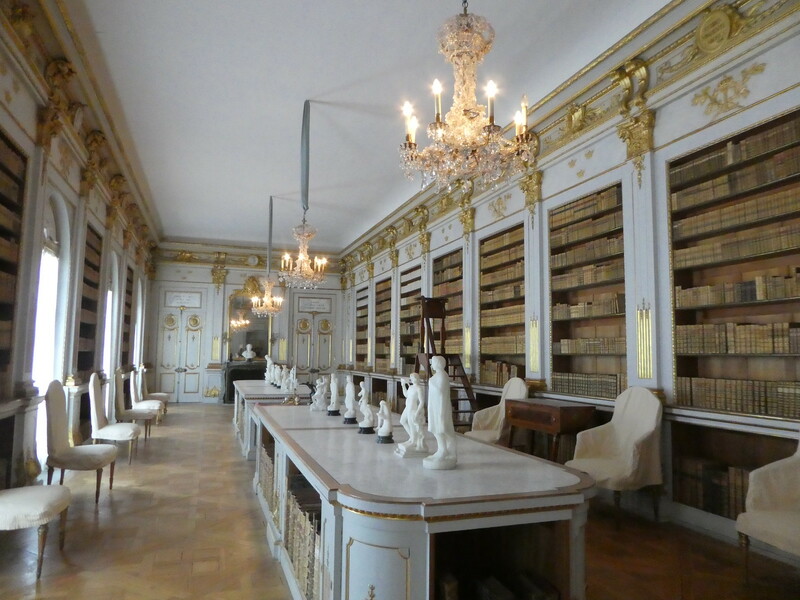 Thank you for taking an interest in this post and it’s fascinating to read about the Baroque theatre. Thank you for sharing!! Beautiful place to visit! Thank you for taking an interest in this post. Great photos! This is on my bucket list! Thank you for your much appreciated thoughts. It’s so nice to read you are enjoying my Stockholm posts. Stockholm does seem to have a lot to offer . Knowing me, I would definitely check out the ice hockey arena as so many professional hockey players are from Sweden. I didn’t know that Stockholm had an observation wheel.A lot of cities seem to have them now. 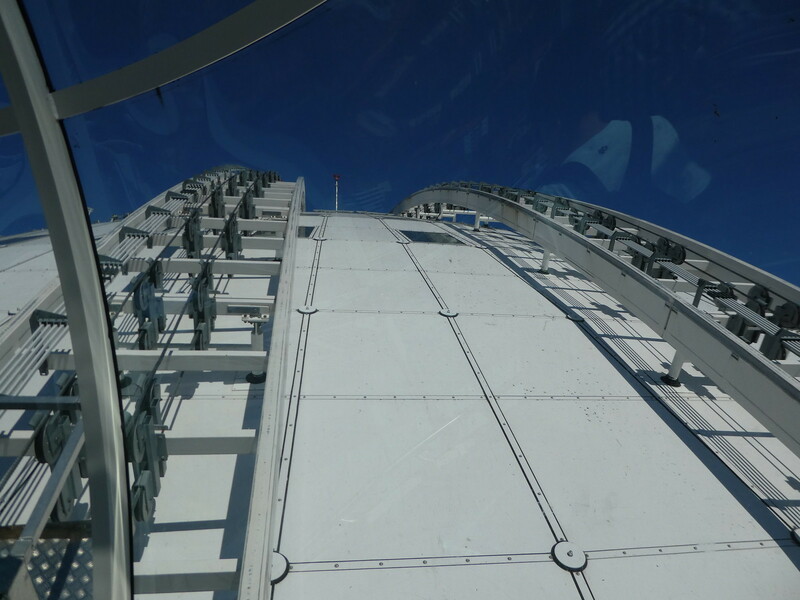 One of the tallest observation wheels is on my bucket list. It’s the High Roller observation wheel on the Las Vegas Strip . Looking forward to reading about more adventures in Sweden. Thank you for your interesting thoughts. Once when we were in Finland we went to see an ice hockey match in Helsinki and it was so exciting! That must have been fun. The Finns and Swedes have some of the best players in professional hockey and the fans really get into it, just as much as the Canadians do. Little Miss Traveller how wonderful. I visited a few months ago and you have captured everything perfectly. Well done. Thank you so much for your kind words Cecily, they are much appreciated. The palace looks magnificent. You gave me another reason to visit Stockholm. Thank you for your kind words. I do hope you get an opportunity to visit Stockholm soon. Wow what a busy day, you really packed it in didn’t you? Three boat trips in the same day and the place looked fantastic. Great weather too. Stockholm looks to have so much to offer. We were pleasantly surprised to find so many lovely things to do in and around Stockholm Jonno. You had a very busy day. I love Stockholm there is so many things to see. The palace looks beautiful. Stockholm is delightful and the weather was amazing throughout our stay. Thank you for your welcome thoughts. Some of the hotels I’ve stayed in around the world have those glass gondolas on the outside of the hotel and looking down through the glass floor has always knotted my stomach. 🙂 What a lovely trip and so well explained too along with supporting pictures. You really must produce a travel book. Thank you Ian for your good wishes and support. It’s always a pleasure to read your comments.